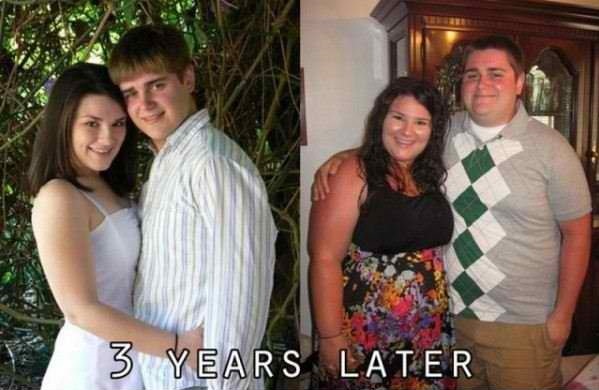 Studies proved that couples happy with their relationships tend to gain weight in the long term. The 'love weight' is defined as the weight gained by lovers in their relationship. So does that mean that if couples start getting fat they are really happy with their relationships? The concrete reason behind weight gain is that couples who get along tend to prepare food together. Or buy food in supermarkets together. Compared to people living alone, people in a relationship rarely skip meals. It is also observed that newlywed couples gain at least 5 pounds a month after marriage. But it doesn't mean that uncontrolled weight gain is healthy. Everything should be in moderation. Healthy living and exercise should still come into play despite weight gains. Obesity is far from healthy, weight gain should always be kept in check. The video below explains the love weight further.